Gain valuable skills that prepare you for problem-solving in a digital world. Note: if you are looking for the assessments themselves, you can access them on our homepage. The world of work is changing continuously, rapidly integrating use of new technologies in jobs. Most employers require all job seekers to apply online. Frontline service workers in many industry sectors now rely on automation and digital tools in their work. Jobs require employees to know how to use email, search the internet, create documents, and handle other digital literacy tasks, such as managing benefits online. Many jobs have become inaccessible to adults who lack digital literacy skills. When people lose jobs, they have to apply for unemployment benefits online. When they start looking for new jobs, they may find that computer skills are required that they don't yet have. Building computer skills, and being able to prove these skills to employers, can improve job-seeking success. Do you need a way to demonstrate basic computer and digital literacy skills to employers? Completing the Northstar Digital Literacy Assessments can help you identify areas in which you need further education. Once you have mastered the needed skills, you can obtain a Northstar Digital Literacy Certificate by successfully completing the assessments at an approved testing location in a proctored environment. You can also claim a digital badge to put in your Digital Backpack. Northstar is used in many Adult Basic Education (ABE) programs and community colleges to assess test takers' computer skills. It is also being adopted by K-12 programs. The standards have been established as statewide digital literacy standards for Minnesota Adult Basic Education, and been integrated into the Minnesota State Standard Adult Diploma. Northstar is widely used by Rhode Island, Vermont and New York ABE programs, community colleges throughout Kansas and Georgia, Delaware education programs, and many other colleges and schools. Northstar is also used as part of digital literacy education and assessment programs in library systems, including Washington, D.C., Minnesota, Nevada, and others. Most recently, Goodwill programs nationwide have begun using Northstar as an assessment component of the Google-funded Goodwill Digital Career Accelerator program (designed to provide digital skills education to over 1,000,000 people over three years). Nonprofits throughout the country use Northstar to assess the progress of clients participating in basic computer classes. Northstar is intended for use as an assessment – it is not a curriculum. However, when individuals complete an assessment at a testing location, they receive a report of areas needing work with links to online resources for learning and practice. Curricular resources for classes are listed on the sidebar for this page. Next year, we plan to integrate curricula directly into Northstar. Employers can be confident that certificates indicate demonstrated competence in computer digital literacy skills, as measured by the assessment. The standards reflect basic computer competency benchmarks common to many jobs. The online assessment modules are designed by professional educators to assess mastery of the standards. Modules evaluate user knowledge in an objective manner, relying on carefully designed questions that require users to demonstrate skills according to predefined and validated values. Modules are constructed around ‘real life’ scenarios, making them practical and useful to both end users and employers. Modules are extensively piloted to ensure reliability of results. Standards and modules are also updated regularly to reflect changing technology and workplace expectations. You can download a copy of Northstar's recently updated standards, which define the basic skills needed to perform tasks on computers and online. Online, self-guided assessment modules assess the ability of individuals to perform tasks based on these standards. Northstar's standards and modules cover the three categories below. Please note that only the topics below that are marked as "updated" have an updated module that corresponds to the updated standards shown; otherwise, the existing module is based on the older standards shown. We anticipate that all of Northstar's modules will be updated by early- to mid-2019. Updated standards for Northstar V2. If you need to reference our old standards, you can download them. Identify the different ways a person can connect to the internet. Demonstrate knowledge of browsers and identify commonly used browsers. Demonstrate familiarity with website structure (e.g., landing pages, internal pages). Identify top-level domains (e.g., .edu, .com, .org). Demonstrate understanding of how to use browser tools and settings to protect privacy (e.g., private browser windows, clearing search history, and declining to save passwords on shared computers). Demonstrate understanding of when it's safe and appropriate to share personal, private, or financial information (e.g., recognizing phishing attempts, identifying unsecured websites). Identify ways to protect your devices (e.g., anti-malware software, recognizing possible virus attacks). Demonstrate to a website that you are a legitimate user using CAPTCHA or other verification methods. Identify address bar and demonstrate understanding of its functionality. Identify common browser tools and icons (e.g., favorites, downloads, refresh, and back). Perform internet search using clear parameters (terms and filters). Demonstrate ability to scroll up and down a page and left and right on a page. Identify and make use of common website interactions (e.g., play buttons, hyperlinks). Identify and work with tabs and windows. Enable a specific pop-up window. Use shortcut keys, or menu or mousing equivalents, to support user experience on the web (e.g., zoom, find text). Define email and identify common email clients. Tell the difference between a URL and an email address. Register for a new email account, using a professional user name and a strong password. Create and send an email, including recipient address, subject, and message. Open and reply to an email. Understand why and how to reply, reply all, and forward an email. Add an attachment to an email. Open and download an email attachment. Manage email: Delete and retrieve messages, identify spam, and unsubscribe from unwanted mailing lists. Understand basics of email etiquette (using salutations and closings, avoiding all caps, making use of the subject line, understanding when it's ok to forward messages, knowing who to cc or bcc, etc.). Use caution when opening or replying to an email from an unfamiliar source, downloading attachments, following links, or giving out personal information. Sign out of email, especially when using shared computers. Identify the parts of the Windows 10 interface (desktop, taskbar, etc.). Demonstrate knowledge of the Windows Start Menu, including Get Help. Use Cortana to search for a file, program, or document. Identify icons, functions, and any file extensions related to basic office software (Word, PowerPoint, and Excel) and default Windows programs (Microsoft Edge, Windows Defender, etc.). Open, close and switch between windows. Demonstrate knowledge of Windows File Explorer and identify drives on the computer, as well as cloud storage services (e.g., OneDrive). Move documents and files, including to and from Recycle Bin. Use Settings to uninstall or modify apps. Use Finder to locate files, folders, and applications. Move and delete documents or files. Identify devices on a computer. Open applications using the Application Folder. Open applications using the Dock. Close and switch between applications. Demonstrate knowledge of System Preferences. Use Spotlight to locate a document. Log out and shutdown a computer. Identify the parts of the Word window, including the Ribbon, Status Bar and Quick Access Toolbar. Save a document, being intentional about name and location. Identify file extensions that can be opened by Microsoft Word. Use Spelling and Grammar check. Format text: size, color and font type. Set text spacing and alignment. Apply bullets and automatic numbering. Modify page layout, including margins and orientation. Insert objects into a document, including images, shapes, hyperlinks, and tables. Open and close a workbook. Save a workbook, being intentional about name and location. Identify parts of Excel Screen: ribbon, formula bar, active cell, name box, column letter, row number, Quick Access Toolbar. Adjust row and column size. Identify worksheet tabs, create a new tab, rename tabs, and rearrange tabs. Use Auto Fill and AutoSum (Sum, Average, etc.) and understand the differences between them. Sort (least to greatest, alphabetically, etc.) and filter data. Insert a chart to display data. Select a print area, choose page orientation, and print. Open a new or existing PowerPoint presentation. Identify parts of the PowerPoint screen (slide navigation pane, slide pane, notes, the ribbon, quick access toolbar, and scroll bars). Insert new slides, duplicate, or reuse slides. Manage text (insert, delete, copy, cut and paste, drag and drop, format, and use spellcheck). Apply or change a theme. Insert items into a presentation, resize, and adjust them (video, chart, pictures, clip art, screenshots). Add a textbox, adjust it, resize it, or delete it. Change the view (normal view, slide sorter, reading view, slideshow view). Insert, delete, and move slides using slide navigation pane. Apply and customize slide transitions (select, preview, add sound, automatic advance). Understand the basics of PowerPoint etiquette (limited text, text that stands out on background, clear titles). Play a slideshow, advance through the slides, and end slideshow (using screen toolbar features). Save a presentation as a .ppt, .pdf, .png, etc. Identify different types of social media and their primary functions (Facebook, LinkedIn, Twitter). Create a new account on a social media network. Recognize information posted by others or online or on social media networks that may present a risk to you (user as consumer of information). Demonstrate knowledge of managing 'friends' on Facebook: adding friends or accepting/declining 'friend' requests. Demonstrate an awareness that social media accounts have privacy settings that can be set by users. Demonstrate an understanding of the consequences of 'liking' something. Share content by uploading media. Identify information that is unwise to post and/or upload on a social media (too much personal sharing, inappropriate photos/comments) (User as publisher of information). Distinguish between public and private 'spaces' on social media sites (ex: Facebook messages and Facebook wall). Post, share, like or comment on content. Demonstrate knowledge of the permanence of anything posted on the internet. Define a problem, formulate a question, or identify a decision that needs to be made. Identify the purpose for accessing information (how the information will help solve the problem, answer the question, make a decision, or accomplish a goal or objective). Define the kind of information needed to complete the task. Identify types and formats of information found online (articles, databases, images, videos, etc.). Plan steps required to solve the problem or accomplish the task. Recognize the costs, in time or money, and benefits of accessing different sources of information (article, newspaper, consumer reports). Demonstrate use of efficient search strategies to hone in on relevant information. Locate relevant information in media found online, including text, video, images, etc. Locate the source of the information. Make use of hyperlinks to follow desired/required path of information. Demonstrate basic understanding of use of non-Internet sources of information (personal documents, Excel spreadsheets, etc). Discern between relevant and non-relevant information in an information source and select the information that addresses the issue that motivated the search. Determine the quality of information by identifying bias, assessing the reliability of sources, and identifying the impact of context. Monitor extent to which information solves a problem and know when additional information is needed. Synthesize relevant information from one or more sources. Integrate new information into current knowledge and use it to support understanding, views, perspectives, or opinions. Act on information to solve basic problems or answer a question. Select appropriate format for sharing information, based on audience and purpose, and distribute to intended audience. Evaluate the result of gaining/using the information. Was the question answered? Was the problem solved? Was a better decision made? Was a goal or objective met? Identify tools for determining career aptitude (self-assessment, interest inventories, skill identification, and values awareness). Identify features and timeline of a job search plan. Demonstrate the ability to use search and filter functions in job search sites. Distinguish between skills sets (job skills, transferable skills, self-management skills, and emotional intelligence). Demonstrate understanding of the value of volunteering. Identify steps to prepare for a career or job fair (posting resume, preparing introduction, reading schedule/calendar). Identify ways to research employers, labor markets, and salary ranges. Identify elements of a strong portfolio including work samples and other supportive documents. Identify elements of a cover letter and distinguish between weak and strong cover letters. Identify best practices for sending and following up with resumes. Demonstrate understanding of hiring processes (including recruitment, screening, and selecting). Identify the basic principles of direct employer contact (in-person, telephone, video calls, social media, and email). Identify key steps in preparing for an interview including identifying common interview questions; distinguish between strong and weak answers to interview questions; how to practice for an interview, giving answers for gaps in employment or previous incarceration. Distinguish between different types of interviews (such as screening, selection, informational, work sample, peer group, group, luncheon/coffee, stress, video conference, etc.). Distinguish between legal and illegal job interview questions; appropriately respond to illegal questions in an interview. Identify key post-interview steps (contacting references, thank you notes, social media). Demonstrate understanding of proper etiquette throughout the job search process, including when you are not hired. Demonstrate understanding of negotiables: salary, schedule, benefits, professional development, training, and vacation time. Identify best practices to be successful on the job (including meeting employer expectations, making arrangements so that responsibilities and problems outside of work do not interfere with the job, learning new skills, dressing professionally, showing appreciation, and accepting constructive criticism). 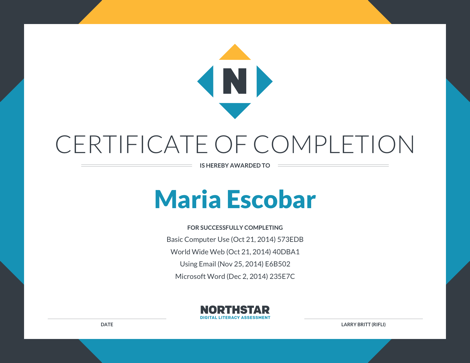 Individuals who receive a score of at least 85% on a proctored assessment completed at a testing location can earn the Northstar Digital Literacy Certificate. Those successfully completing multiple assessment modules have the option of receiving a summary certificate listing all modules passed. Those passing assessments can also claim digital badges from Northstar, which follow the OpenBadges specification (read more at https://openbadges.org/about/). Badges are a way to display and document skills learned both in and out of the classroom. Once a test taker is awarded a badge, it is stored in the test taker's Backpack, a webpage that serves as a transportable portfolio to share with employers or others who need to know a user's skills and experience. Badges are an ideal means by which Northstar test takers can keep a permanent, accessible record of assessments they have passed. What curricula align with Northstar? I learned a lot of things in this class. It will help me when I go to the GED classes and take the tests, which are online. Technology is always changing, so I really need these skills. I feel more comfortable with computers. I used to call and ask my kids all the time to help me use the computer, but now I'm independent! If you don't know how to fill out an online application, you need someone to help you, but now I feel like I'm the boss of the computer. Mothers want to be able to check their kids' school progress, and if you know how to use the computer, it's easy. You can follow your kids' school progress online through their gradebook.